Archaeological work over the last 40 years, on both sides of the North Sea, has produced vast quantities of material culture from the high Middle Ages, some of its spectacular (for example the commercial waterfronts located in London, Hull, Dordrecht and other towns), some contributing to art history (such as the painted tombs in the church of Onze-Lieve-Vrouwe, Bruges), much investigating the rural landscape (as on the Flemish and English coastlines) and a great deal increasing understanding of the development of ships, construction technology and the potential information to be gained from applied scientific techniques. This lecture will provide a brief overview of archaeological contributions to exploration of the medieval North Sea world. 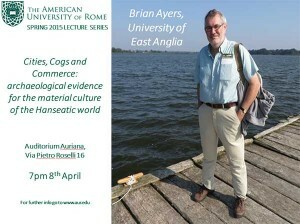 Brian Ayers is currently a Research Fellow and Honorary Senior Lecturer at the University of East Anglia. He was Assistant Head of Museums & County Archaeologist for Norfolk until 2008. Thereafter he became the Chief Executive of the Butrint Foundation until the end of 2011 (for which organisation he continues as a consultant) and which works to secure preservation of the World Heritage Site of Butrint in Albania. He is a Fellow of the Society of Antiquaries of London (where he is currently the Hon. Secretary) and of the Royal Society of Arts. He is also a Member of the Chartered Institute for Archaeologists, a trustee of Hungate Medieval Art (a trust located in the church of St Peter Hungate, Norwich), a member of the ICOMOS-UK Cultural Tourism Committee and a member of the East of England Advisory Board of the National Trust. In addition he leads archaeological tours of Viking Age sites in Britain and Scandinavia. He has published numerous papers, principally concerning urban archaeology, and is the author of an archaeological history of the city of Norwich. He is currently writing a book with the provisional title of Medieval Europe around the North Sea.